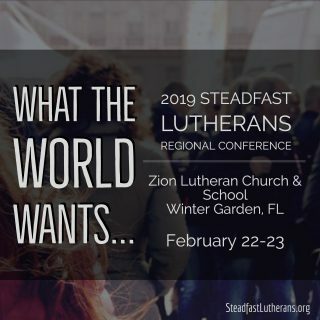 The 2019 Steadfast Lutherans Regional Conference in Orlando, FL takes place later this month. We’ll be meeting Friday, February 22, and on Saturday, February 23 to consider “What the World Wants…” If you haven’t signed up already, be sure to sign up so we know how many to expect! We reworked the schedule a little bit, but we’ll still cover all of the same topics in the presentations. Pastor Preus’s paper, “The World Wants Ugly Women,” will give a biblical, confessional, and historical critique of the Feminist movement that is wreaking havoc in our homes, churches, and society, and he will teach the definition of true, godly beauty found in Holy Scripture. 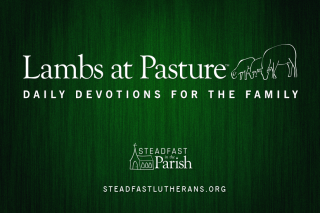 Pastor Richard’s paper, “The World Wants Numbers,” will address the misconception that numbers and truth go together—What’s popular is not always good, right, or salutary. 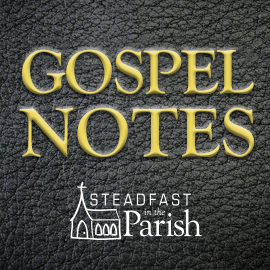 He will talk about how this idea has crept into popular teachings on evangelism, and how we should learn to trust in God’s Word above the numbers we see. “The World Wants the World” is Pastor Rojas’s paper on arrogance and pride. He will show how pride runs through all of our sins, and how many of the most popular movements of the day—cohabitation, abortion, homosexuality, contraceptives, promiscuity—are motivated by it. He will also teach on the solution to pride found in the humiliation of Christ. Finally, Pastor Deal’s paper, “The World Wants Your Church,” will expose the devil’s attacks on the Church. He will show how the devil tempts churches to unfaithfulness, and he will equip us to withstand these attacks with the Word of Christ. Last year, we had a good number of attendees stay for the Divine Service the next day. The Pastor Tim Rossow gave a presentation for Lutherans in Africa (LIA), and he preached at the Divine Service. Although this is not officially part of the conference, this year, Pastor Deal will lead the Sunday morning Bible study and Pastor Preus will preach in the Divine Service. I’ve never attended a conference. Is the assumption that most people schedule a flight out SAT evening in order to attend services SUN morning, or do they attend SUN at the host congregation? It really depends. Last year, Pastor May had to preach at a congregation up in Minnesota, so he left Saturday evening. I am taking some vacation time so I can stay a few extra days. I think that’s probably what most of the pastors who fly in do. If you can make it, it would be great to see you there. Pastor Preus is right. This year, all of the presenters and their families are staying through to Sunday and will attend the Divine Service on the 24th at 9:30 AM. Last year, members from other congregations who visited stayed for the service as well. Let me know how I can help and if there’s anything I can do to help you out.